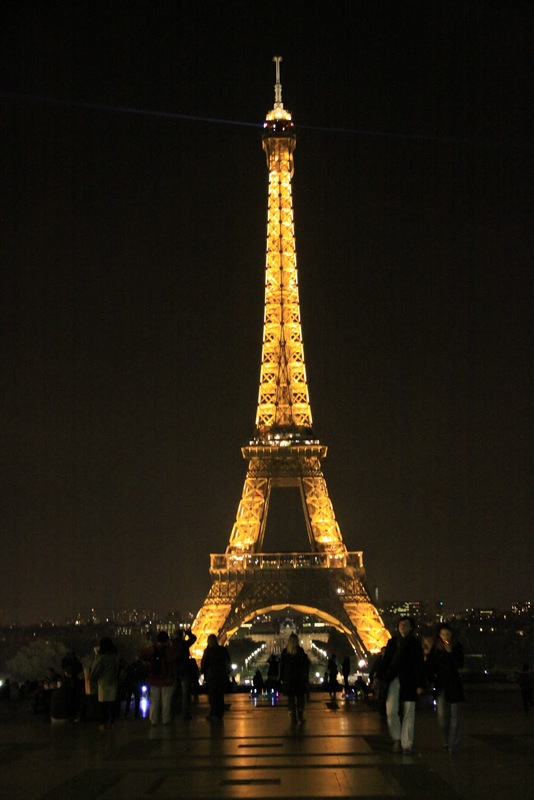 My token Tour Eiffel photo from tonight. Taken by me from the area near Trocadero after we visited the top. We went to the top at 7:30, right after the sun had set. It is a beautiful site, day or night. It was crowded, but not too crowded. I wonder if it is ever not crowded? Why do people always try to squeeze into elevators that are already full? Another one is always coming. I think it would be fun to have dinner at one of the two restaurants in the tower. I am sure they are pricey and the food probably isn't very good, but I bet its a fun thing to do. Have to plan way ahead to get reservations. Next time. We had waffles with sugar and hot chocolate right outside before we went to the top. It was a great idea. Passed on the 15 Euro tiny glass of champagne at the top. Saw a woman popping a small bottle of champagne that she had snuck in...that would be the way to do it. At the top, looking around and down, I wondered - all these years of people visiting the Tour Eiffel, how many people had proposed to their significant others there? And how many had accepted? How many cameras have dropped over the side? How many hats have blown off in the wind? How many paper airplanes launched? How many people have tried to throw themselves over the side? These are the random things that go through my mind.